Jim Murphy officially launches the party's campaign and pledge card. Picture: John Devlin. JIM Murphy has said the SNP stands in the way of a Conservative defeat, as he challenged the Nationalists over why the party was failing to call for a Labour vote south of the Border if it wanted to see David Cameron forced out of power. Mr Murphy stated that Labour in Scotland and in other parts of the UK would build its own “real progressive alliance”, at the launch of his party’s campaign north of the Border yesterday. The Scottish Labour leader hit out at the SNP after First Minister Nicola Sturgeon called for Labour and the Nationalists to be part of an anti-austerity force to keep the Conservatives out of power in Westminster. He also suggested that a vote for the SNP on 7 May would deprive his party of the seats it needs to form a government, and that it could also lead to the Conservatives ruling over Wales and the north of England. 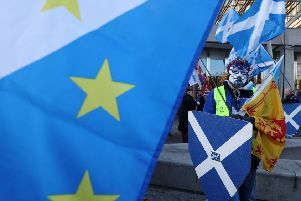 Mr Murphy, speaking in his East Renfrewshire constituency, attacked the SNP for failing to back a Labour vote south of the Border to defeat the Conservatives and accused Ms Sturgeon of instead promoting the Greens in England and the Welsh Nationalist party, Plaid Cymru. He said: “It is far from clear whether the SNP really want a Labour government at all. The First Minister says she sees no difference between the two parties. “She says she’ll vote to bring down a Labour government. And she doesn’t want people, here or elsewhere in the UK, to vote for Labour. “Of course she wants people in Scotland to vote SNP. But she urges people in Wales to vote Plaid and in England to vote Green. Mr Murphy also warned that a vote for the SNP could have negative consequences for people in Labour-dominated cities such as Liverpool and Cardiff, by allowing David Cameron to remain in power. Mr Murphy said: “For years we heard the SNP argue that it was people in England that voted to give Scotland a Tory government. Now Labour is ahead in Wales, in all the cities of the North, the polls suggest we are far ahead in London. “It would be deeply ironic if the only people in the UK that stood in the way of a Labour government were SNP MPs in Scotland. However, Mr Murphy said Labour would form its own progressive alliance between its Scottish MPs and those in northern England and the Midlands, as well as from deprived parts of London.